Objects in this image are not as large as they appear (but they do have this much flavor). 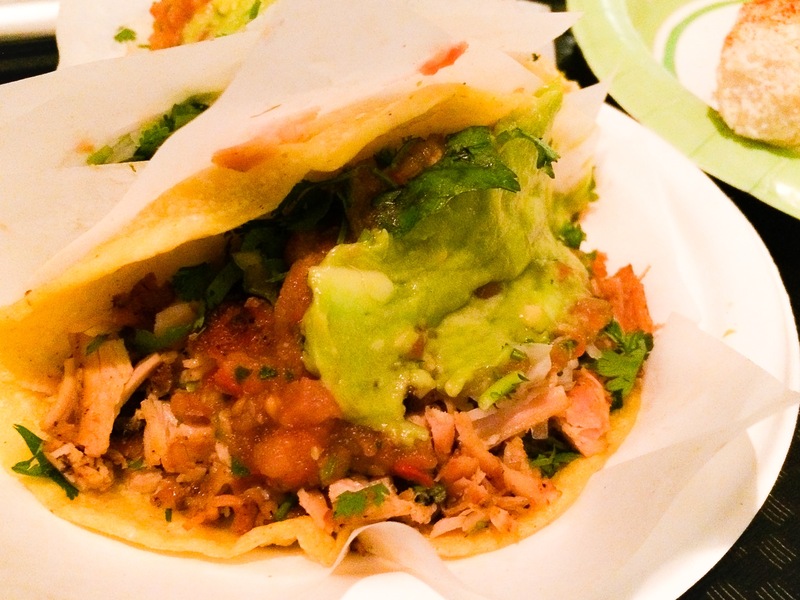 The rich flavors, heartwarming smells, joyous sounds – Mexican restaurant Taco y Taco in Henderson combines the best of street food and urban dining. Upon walking in, you’ll notice the establishment carries the elegant black and white look of the exterior through the restaurant. It’s a lesson is cultural fusion. Visit early in the week and you might get a chance to see Mariachi musicians in colorful garb entertaining a crowd with traditional tunes. Later in the week, the DJs come out. Everything from the layout to the salsa bar to the upstairs dining area sends the message that it’s a relaxed but sophisticated urban spot, not your typical suburban taco joint. When you walk up to one of three lines to order, you’re faced with cooks ready to carve al pastor (pork) and quickly dole out tacos stuffed with chicken, beef or pork. Tacos start at about $2.25, which may seem steep for a small taco, but trust us, they’re stuffed. Topped with onions, guacamole, cilantro and more, the tacos are wonderful for large parties that want to share, trade and sample. The corn, slathered in mayo before being topped with cheese, is rich and flavorful. Though it’s called Mexican-style corn, it’s far less messy than any street corn we’ve had. Looking for a relaxing space for a date? Try visiting during Happy Hour, and we highly recommend snagging a table upstairs for a better view and a bit more privacy. Our sources say Thursday afternoon and evening are the best times to go to avoid crowds. Fair warning – this place can be packed, but if you love great, authentic food and a restaurant with character, Taco Y Taco is definitely a Vegas-area highlight.